The Rudolfinum is a prestigious music and art venue located on Jan Palach Square on the bank of the Vltava River in Prague. This impressive neo-Re­naissan­ce bu­il­ding was built between 1876 and 1884, opening in 1885 to serve as a multi-purpose cultural center combining concert halls and exhibition rooms. Today, the Rudolfinum is home to the Ga­le­rie Ru­dol­fi­num and hosts a varied programme of classical music concerts and art exhibitions. 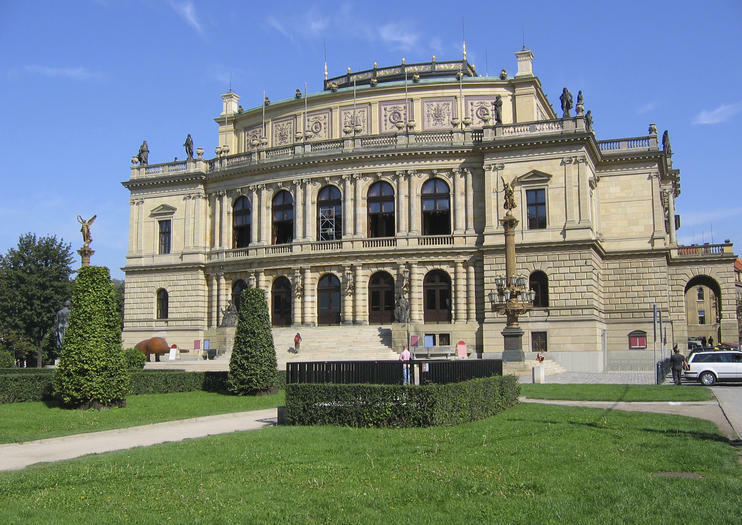 It is the home venue of the Czech Philharmonic Orchestra, which was founded in 1896. The Philharmonic Orchestra holds world-class classical performances throughout the year from the building’s largest hall, the Dvořák, which is one of the oldest concert halls in Europe and is noted for its exceptional acoustics. As well as being able to buy tickets for various performances and exhibitions at the Rudolfinum, guided tours are available for those interested in the history and architecture of the building. The Rudolfinum is located in Prague’s Old City. It can be reached by alighting at Staroměstská station on Line A of the metro, or by taking a tram (numbers 17, 18, and 53) or the number 207 bus. Soon after its founding in 1896, the Czech Philharmonic became the most noteworthy orchestra in the country – even as soon as before the First World War the orchestra had built a considerable reputation for itself in concert halls across Europe. Over the course of its more than 120 year history, the orchestra has fostered numerous significant personalities among its ranks.The history of the Czech Philharmonic Orchestra is closely connected with its seat – the historical building of the Rudolfinum in the center of Prague on the bank of the Vltava river. Listen to live music and feast on a dinner buffet during this 3-hour evening river cruise in Prague. You’ll glide past a panoramic skyline and be treated to views of city monuments illuminated after dusk. Receive a welcome drink from the full bar while you float along the Vltava River and see the sights, including the Charles Bridge, Vyšehrad, Straka Academy, Rudolfinum, Prague National Theatre and Sova’s Mills on Kampa Island. Experience the full, floodlit magic of Prague by night on this leisurely 3-hour evening tour and dinner cruise. Sip a welcome aperitif and enjoy a delicious buffet dinner and accompanying music as you waft by twinkling Prague Castle, the Charles Bridge and other sights. This Prague cruise and tour promises a wonderful, relaxing end to a busy day of sightseeing. Feast your senses on Prague’s traditional beer culture on a 3-hour tour. During visits to three popular pubs, you’ll sample three distinct varieties of Czech beer. Along the way, learn about beer’s cultural significance, master pouring a perfect pint and delve into Prague’s rich history with your guide. At your final stop, you’ll sample tasty Czech treats, including a hearty goulash, and receive recommendations for vibrant nightlife venues. On this small-group tour — limited to beer lovers — you’ll receive personalized attention from your guide. Ideal for first-time visitors or those short on time, this guided walking tour covers all of Prague’s essential sights in just 3.5 hours. Visit the UNESCO World-Heritage listed Old Town, Lesser Town, and New Town; stroll through the historic Jewish Quarter; and snap photos of landmarks such as the Charles Bridge, Prague Castle, and the Old Town Square. Combine some of Prague’s signature sights with off-the-beaten-path attractions on this half-day walking tour. Check off Prague Castle and the Charles Bridge, stroll down Prague's shortest street, see the workshop that made the stained-glass windows of St. Vitus Cathedral, and indulge in a Czech lunch (own expense). Since this is a small-group tour, you'll have plenty of time to ask questions, too. This walking tour leads you along the cool and shady passageways of Prague Castle. As you stroll through the Royal Palace, St. Vitus' Cathedral, St. George's Basilica, Lobkovicz Place and Golden Lane, your guide narrates the history behind the castle's centuries-old stones. Discover the castle's varied history before walking through the Lesser Town to Charles Bridge. You will be taken to Prague Castle by bus, (even though it is a walking tour.) Our guide will take you on a tour of the Prague. Castle The Royal Palace, St. Vitus Cathedral, St. George Basilica and Golden Lane, acquainting you with all the important historical details of the Castle. the Prague Castle is the largest coherent castle complex in the world, with an area of almost 70,000 m². A UNESCO World Heritage site, it consists of a large-scale composition of palaces and ecclesiastical buildings of various styles, from Roman-style buildings from the 10th century through Gothic modifications in the 14th century. Explore Prague the way you want with you own personal guide! Choose the parts of Prague that really interest you and benefit from the flexible itinerary!-This tour is designed to give you a quick overview of the city of Prague. If your time is limited, this is a great chance, how the visit all the most important places in Prague. -In all of our tours, everything can be fully adjusted and perfectionalized to your liking. The length of the tour, the pace, the focus of the tour – whether you like to know every historical detail or visit secret viewpoints and the best photo spots. Whether you like to visit the main sights or go off the beaten path hunting authenticity and local atmosphere. -Straight from the booking we lead an open dialogue with you to create the best possible experience.Tour start can be adjusted, please let us know, if you like to start any other time than listed. Beat the crowds, and get up close and personal with Prague’s best-known sights, on this private, half-day walking tour. Pick from convenient morning or afternoon departure times, and meet your guide directly at your local accommodation. Over the course of the tour, you’ll see everything from the Charles Bridge and the distinctive architecture of Prague’s Old Town to Josefov—the city’s historical Jewish quarter—and more. As you go, your guide will share anecdotes and facts about Prague’s wealth of history. Combine sightseeing in Prague with the fun of riding a fat-wheeled Scrooser electric scooter. These distinctive vehicles are easy for anyone who knows how to ride a bike, but you’ll be given a full safety briefing and demo. You’ll be accompanied by a guide who will tell you about the sights you see on the way. This is a fun activity for both adults and kids. Get to know Prague on a 7-hour bike tour that introduces you to the city's top sights. With a guide, you'll cover the whole city, including Old Town, New Town, Prague Castle, and parks. Along the way, hear about Prague's architecture, history, and culture. All gear is provided. Prague Castle is a must-see during any stay in Prague, and this tour covers it in a convenient three hours. Ride a minivan up to the hilltop UNESCO-listed castle — the world's largest — and walk around its treasures and surrounding Castle District. Stroll through the castle courtyards past palaces and monuments, visit St. Vitus Cathedral and Golden Lane as your guide shares their history, and absorb bird's-eye views down over the city. Get a new perspective on Prague and get some exercise at the same time on this 2.5-hour guided bicycle tour of Prague. Learn about the fascinating history of this city from a knowledgeable guide and see some of the city's main sites, including Old Town Square, the National Theater, Charles Bridge, the John Lennon Wall, and the old Jewish quarter, among many more points of interest. Drift along the Vltava River through Prague and see the sights from the water on this 1- or 2-hour cruise. Settle on the outdoor or interior deck, and get grandstand views of top Prague attractions such as Prague Castle, the Charles Bridge and National Theatre. Buy onboard refreshments, and on the 1-hour trip, learn about the landmarks and Prague’s history from the informative audio commentary. Upgrade to the 2-hour cruise to sail further along the Vltava past the Vyšehrad Citadel, the stunning Dancing House and other impressive sights. Enjoy an extensive panoramic tour of Prague via bus complete with historical narrative on headphones. The 2-hour tour, which includes a hop-on, hop-off portion, goes to all the major sites, including Prague Castle, Wenceslas Square, Old Town Square, the Charles Bridge, the Jewish Quarter and New Town Hall, among many other sites. Make the most of your time in Prague by booking this comprehensive, private walking tour. In the company of just your party and a guide, see all of the main landmarks as well as some hidden gems and lesser-known areas, as your guide shares insights and little-known stories about each. In between exploring such sites as Prague Castle, Kampa Island, and the Jewish Quarter, take a break for an included lunch in a medieval tavern. This tour gives you a great overview of Prague. Not only you'll cruise through all the historical little streets and squares, but you will also see Prague from a different perspective. You will love the marvelous views from Prague’s best viewpoints and picture spots.-In all of our tours, everything can be fully adjusted and perfectionalized to your liking. The length of the tour, the pace, the focus of the tour – whether you like to know every historical detail or visit secret viewpoints, the best photo spots or just hop around the most relaxed beer gardens. Whether you like to visit the main sites or go off the beaten path searching for authenticity and local atmosphere. -This is a fully custom made private tour. Straight from the beginning we want to lead an open dialogue to create the best possible experience for you. -Starting time is completely up to your choice at any time of the day. Please let us know, what time you'd like to start after you've made the booking.